Dimensions: 3 1/2" x 3 1/2"
This glorious heart has an intricate raised and sculpted scroll design. It is made from polyresin and hand painted in a pewter color. On the top is a round metal wire attached to a soft white satin ribbon for hanging the ornament. 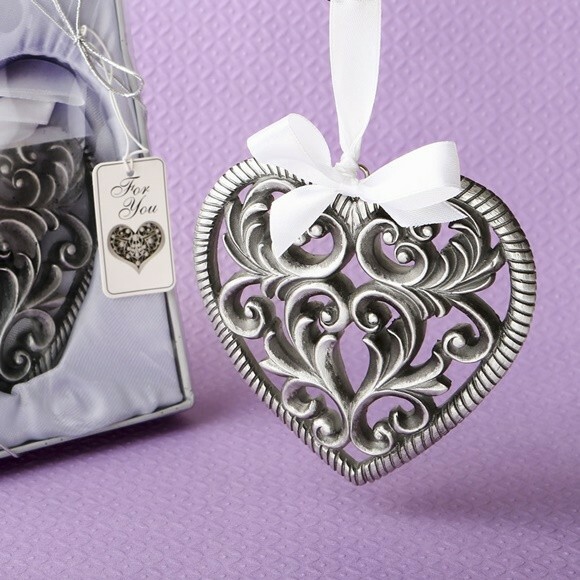 The heart ornament comes exquisitely-presented in a silver-colored display-topped gift-box with satin lining. The gift-box is finished with a silver-colored elastic ribbon and bow. Attached to the bow is a 'For You' tag with a coordinating heart-shaped design. A perfect gift for a Christening, Baptism, First Communion or other religious event. "You've got GREAT bridal shower favors. I'm so happy to have found your website. My order arrived yesterday and you did a wonderful job for me. Thanks!" Joanie H.